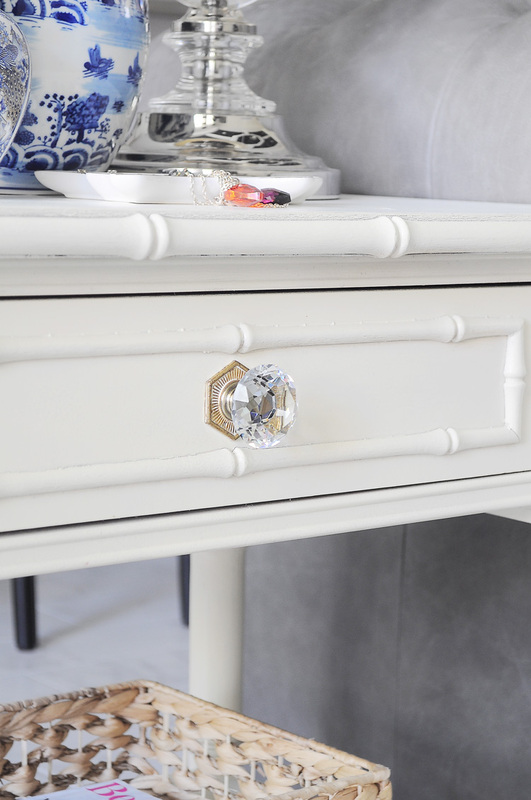 What do you when you find a gorgeous piece of furniture at an antique or thrift store that is so perfect minus one tiny issue, such as it’s a hair too short? Well, if you’re me, you whip out your debit card and buy it anyway and figure out a solution later…which is exactly what I did. 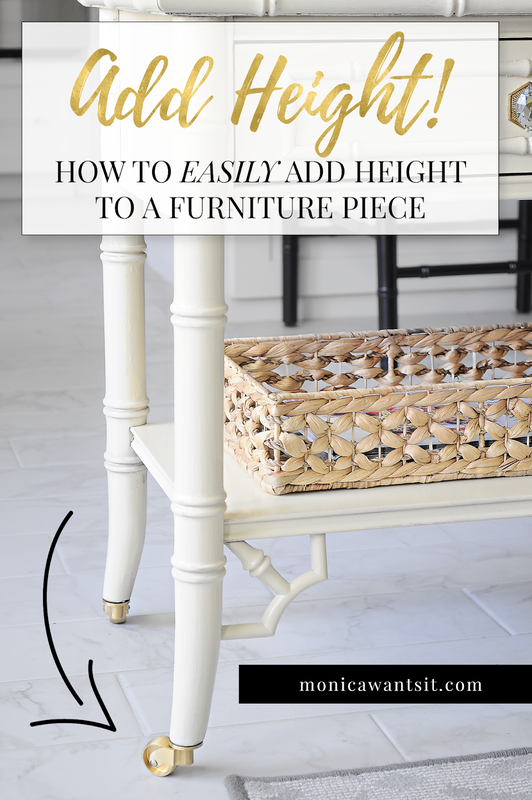 So, today we’re discussing how to add a bit of height to an end table or other piece of furniture. I have been on the prowl for some end tables to flank my chesterfield for awhile. 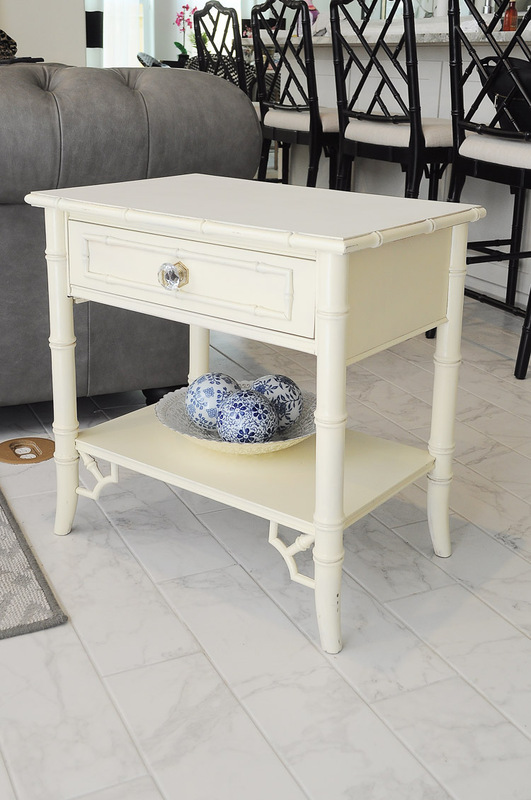 I initially had a glass end table, but I wanted something to complement my chinoiserie inspired bamboo counter stools. Bamboo-esque end tables are so hard to find brand new, and when you do find them, they cost over $900 each like these beauties. One Friday afternoon I decided to visit my go-to antique stores in town, and I came across this pair of end tables. I could tell they had been repainted a creamy ivory color, but despite a few minor flaws they were in fantastic shape for only $29.99 each. I excitedly ran over to the cashier and told her to please clear them off because they were coming home with me. Immediately I swapped the knob out for something a bit more fancy, and then I got to doing research on how to make the end tables a few inches taller. I quickly ruled out sticking a bunch of felt pads under the legs for obvious reasons, I also thought about adding in self-levelers, but the tables would end up looking like they were on mini stilts. 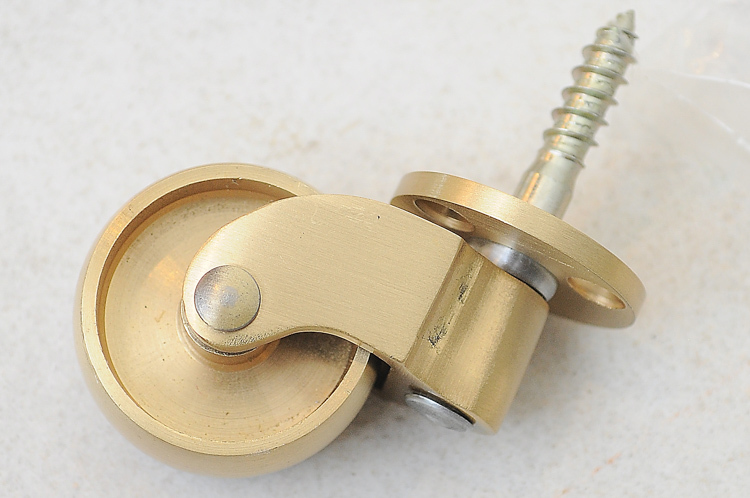 Finally the idea of casters came to me, and I found these beautiful gold/brass mini 1″ casters by Liberty Hardware. They were kind enough to provide my sweet wheels for this tutorial, and this project couldn’t have worked out more beautifully. I am thrilled with the results. 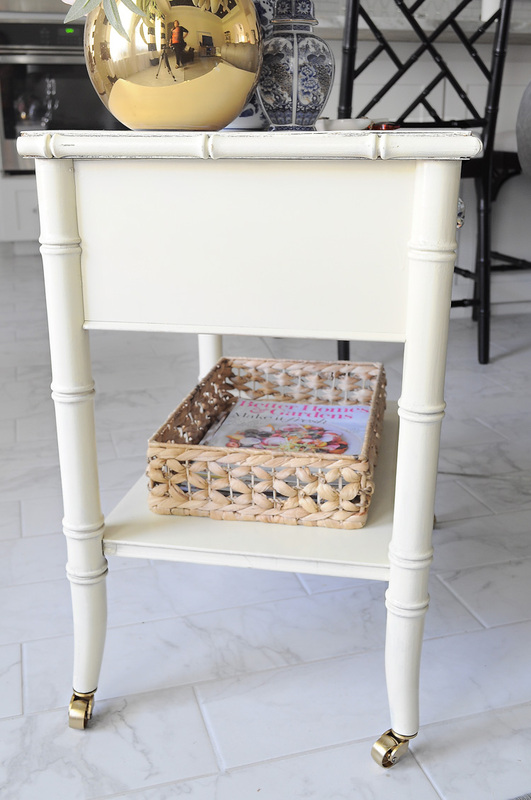 I’ve written up a detailed tutorial below about the process I took to elevate (quite literally) my end tables to new stylish heights. And yes, the casters do work well and I can easily roll around the end tables should I need to when sweeping or mopping. Don’t you just love when form and function work hand in hand? 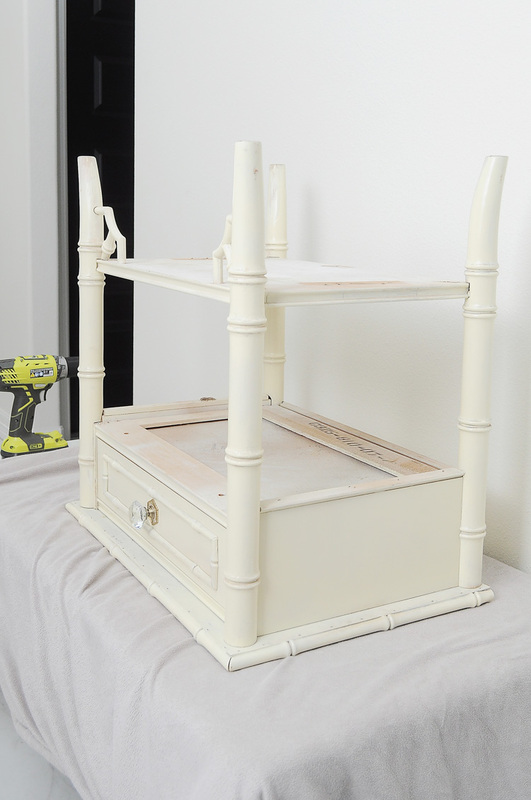 The project from start to finish should take about an hour or so, and anyone from a beginner to an advanced DIY-er can successfully complete this project. 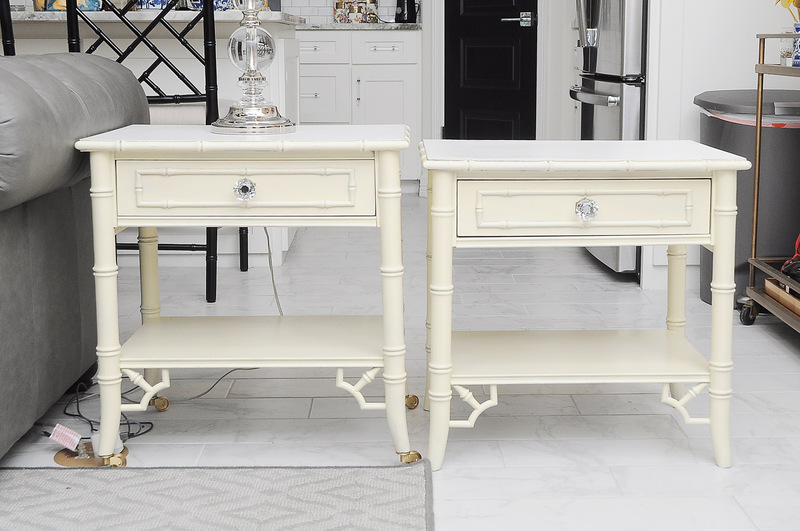 You’ll want to add Liberty Hardware casters to all your furniture pieces- check out all of their caster options here. 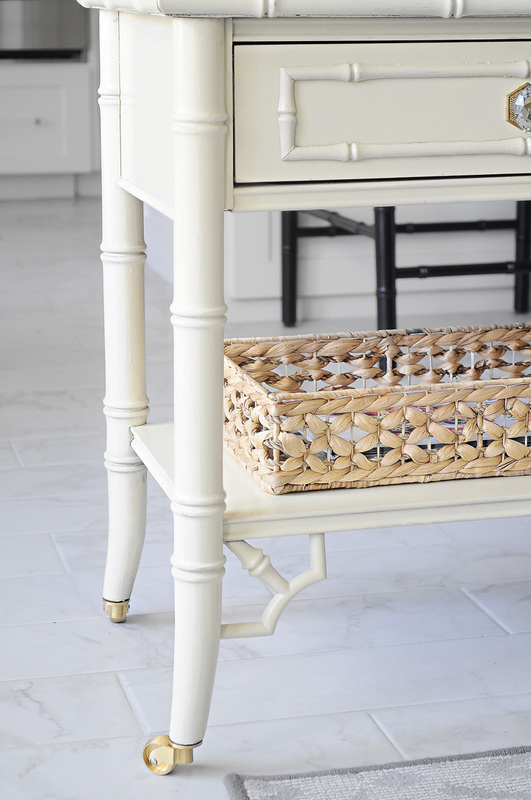 Step 1: On a flat, sturdy and protected surface (to prevent damaging the top of your furniture piece), flip your end table upside down so the legs are facing upward. 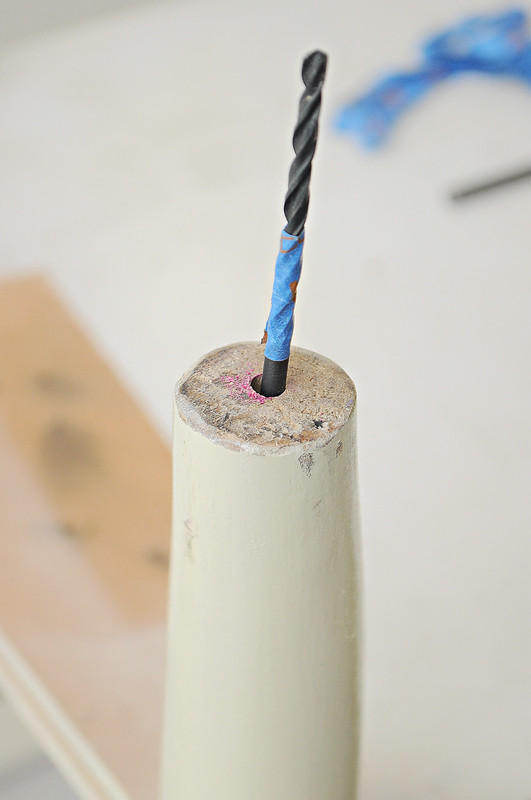 Step 2: Mark the center of each leg with a marker so you know where you will be drilling. Note: please ensure your furniture leg is beefy enough to not break or splinter if you drill through the center of it. My end table legs are solid wood. 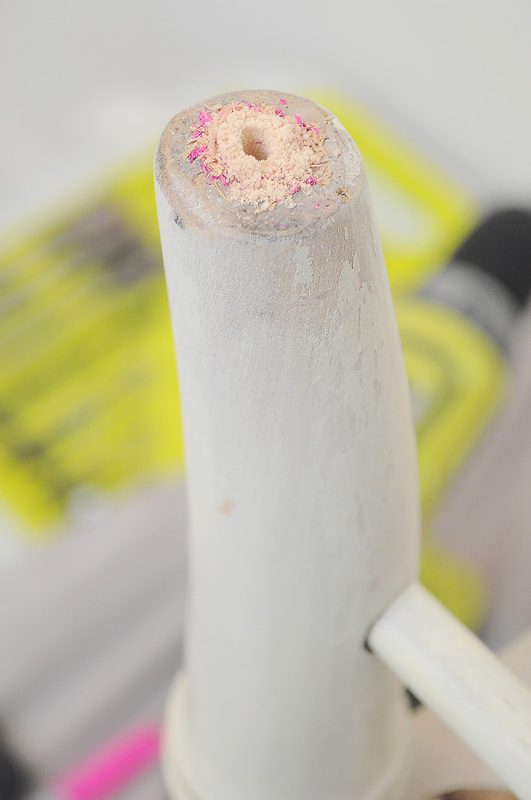 Step 3: Using your 1/4” drill bit, drill a hole where you marked center. You’ll need to go deeper than you feel will be reasonable, but you can always make yourself a template with a spare drill bit and blue painter’s tape to ensure you’ve drilled deep enough for the caster screw to fit in there easily. Once you’re in the “blue” you know you’ve drilled deep enough. It took me a few bursts of drilling to get the pilot hole deep enough. 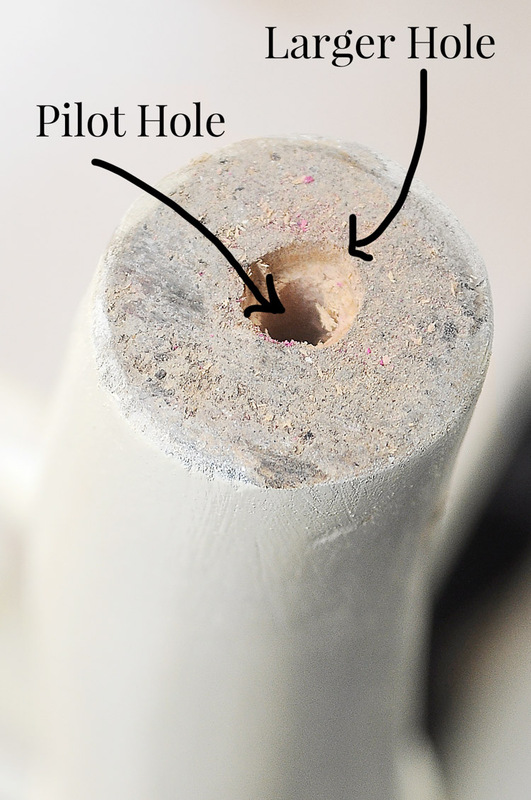 Step 4: Using your 5/16” drill bit, drill a slightly countersunk hole in the exact same hole. See figure below to see what I mean. Essentially you want to create an area for the area just above the caster screw to rest flush and eliminate any gaps. Step 5: Screw in the caster- you’ll do this by hand. If you’re having an impossible time trying to get it in there, likely one of two things is happening: you didn’t drill the pilot hole deep enough (go back to step 3 and try again) OR you’re twisting it in slightly crooked and getting met with a lot of resistance (unscrew it and try again). The last few turns can get a bit difficult, so I had to use a work glove to get some grip for the last bit of it to get on there snug. 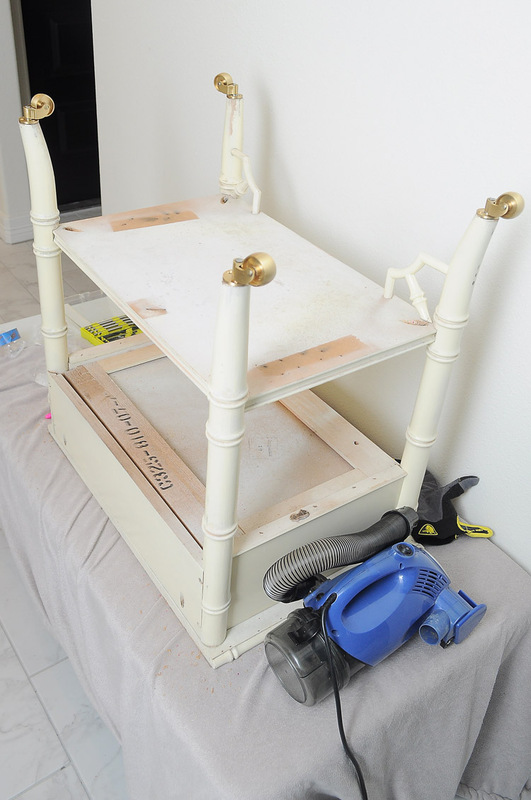 Do the above steps on each leg until you’re all done and have a swanky set of casters on your furniture. I can’t believe the difference in height- it is definitely visually noticeable, and now I don’t feel like I’m reaching down to put a drink on the table when I’m sitting on the sofa. It’s at a more natural level. The little bit of gold really glams them up, plus the casters add a modern vibe to a vintage furniture piece. I mean… isn’t this just meant for my home? 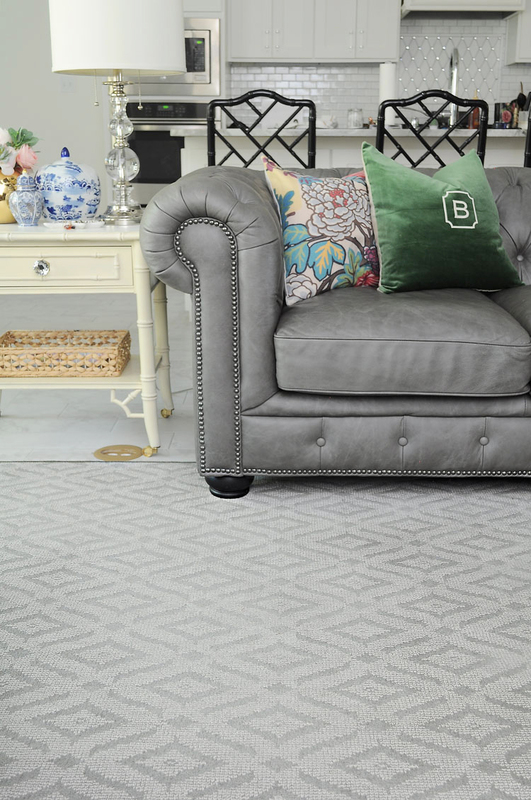 Below is a sneak peek of the new rug! I’ll have full details about that on Tuesday. We’ve had it since June, and I couldn’t love the rug any more than I do. We’re smitten with it. Ignore the mess on the island…seriously, I cannot figure out a way to keep that island cleared off. Anyone else have that problem? It’s become a dumping ground for mail and random things. The next item on my to-do list for the end table is to get a custom mirror top cut to replace the cheap white veneer top. And eventually I may repaint them, but for now I am so happy with how they look. Pin this project for later and let me know what you think in the comments. 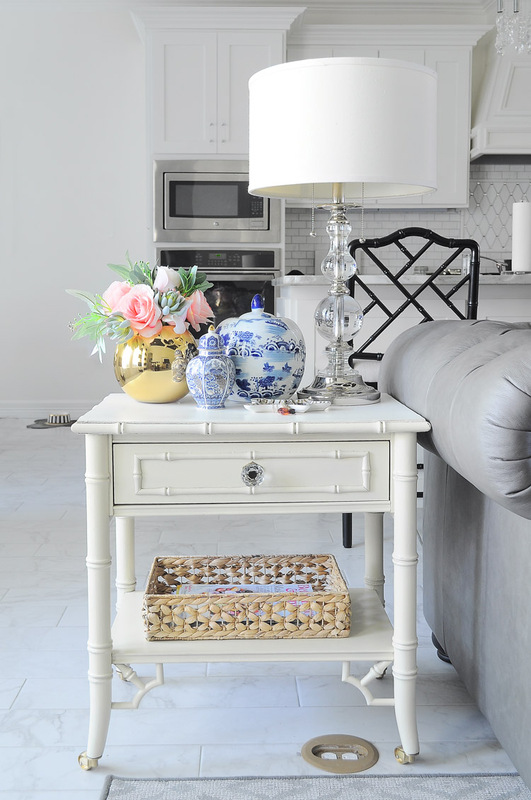 The next time you’re out antique or thrift store hunting, don’t let a tiny issue like height keep you from bringing a piece you truly love home. 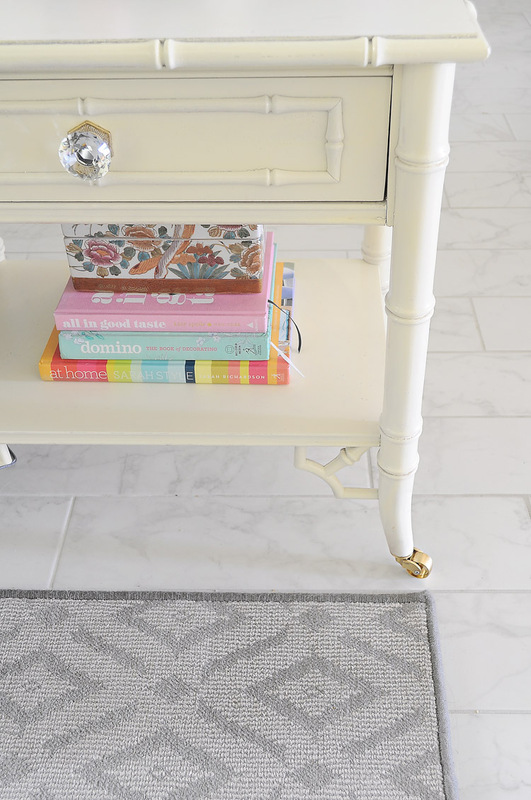 And thanks again to Liberty Hardware for supplying the gorgeous casters! Always looking for great hints like your chair legs ideas. These casters you used are so pretty!! I used this trick to raise up a bed to fit a trundle underneath. Worked great. They are gorgeous—and beautifully styled!! Monica, this is genius. It totally upgrades the tables. I love this idea.